With a TV and radio audience of millions, the annual broadcast of A Festival of Nine Lessons and Carols from King’s College, Cambridge is an essential Christmas tradition for families all over the world. This double album faithfully recreates the magic of the service, opening with a lone treble singing ‘Once in royal David’s city’ and closing with a rousing chorus of ‘Hark! the herald angels sing’. 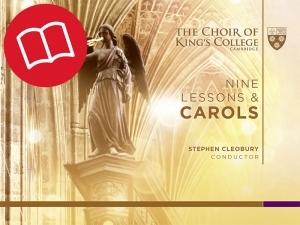 Each year the Director of Music at King’s, Stephen Cleobury, commissions a new carol. Several of these are included on the album, including carols by Einojuhani Rautavaara, Gabriel Jackson, Brett Dean, Mark-Anthony Turnage, Dominic Muldowney and Tansy Davies. In addition, John Rutter has written the new carol ‘All Bells in Paradise’ especially for this album. The album reached #2 on the UK’s specialist classical chart in December 2012. Recorded in the Chapel of King’s College, Cambridge, by kind permission of the Provost and Fellows 24 December 2010, January 2011, and June 2012. Recorded at 48kHz 24 bit PCM.